Is your Wind Spinner Not Turning as well as expected? The swivel is the first thing to check. Swivels will rust and freeze up over time. We do have swivels available on our Accessory page. Periodically spray your swivel with WD40 which will help to make it last longer. When the wind is still, nothing will turn, however, to maximize your Spinners turning ability, we recommend placing the spinner on a piece of fishing line. There is very little restriction on fishing line and your Spinner will turn with just a small breeze. Be sure to use fishing line heavy enough to hold your spinner. (4lb. test) and change it once a year to insure it's strength. If your spinner is flat, meaning the fins are slightly bent but not enough to allow the air to easily go between the fins, the spinner will swing instead of spin. To maximize the spinning effect, the total distance of all fins should be between 60 and 65 degrees. The diagram below provides further detail. Count the number of fins on your spinner. Cut the dashed line that corresponds to the number of fins on your spinner. (6, 7, 8, 9, 10, 11). If your spinner has more than 11 fins, cut on the dashed Purple line. If you spinner have less than 6 fins, cut on the dashed Blue line. 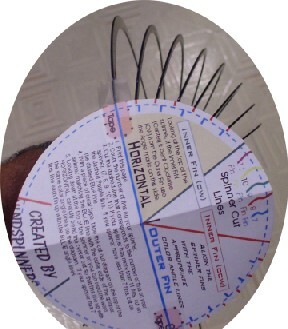 With a piece of clear tape, tape the cutout diagram on the top of the spinner matching the BLUE line with the outer edge of the spinner. 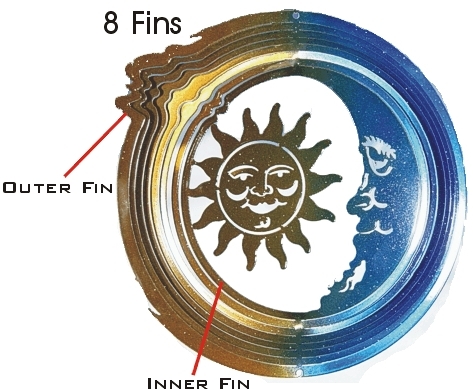 Looking at the top of the spinner, if the Inner FIN (Center) is bent Clockwise (CW) from the Outer Fin use the Angle marks on the left side of the diagram. 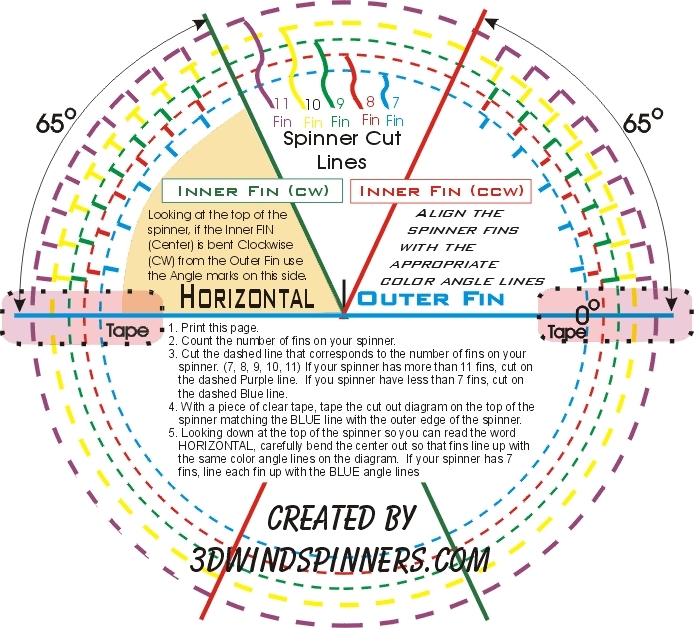 Looking down at the top of the spinner so you can read the word HORIZONTAL, carefully bend the center out so that fins line up with the same color angle lines on the diagram. If your spinner has 6 fins, line each fin up with the BLUE angle lines. NOTE: if your spinner has more than 11 fins or less than 6 fins, the center should line up with the 65 degree line and space the other fins at equal distance from each other.